When you are browsing the web--be it at a computer, mobile phone, tablet or whatever--certain websites will look at that device's "user agent" to determine which version of their website to display. Just as the webOS App Catalog will check to see if you are on a webOS phone or a TouchPad when downloading an app to determine if it should give you the phone or tablet version, a website may display different versions for different devices. That is the reason why a "mobile" version of a site will be shown on your Pre3 while a much more complex version of the same site will display when browsing on your computer. With the popularity of tablets (like your HP TouchPad), there is now a new category of devices that may not be able to handle the full desktop version of a website, but can clearly do more than just the mobile version. In addition, with the enormous market penetration of the non-Adobe Flash supported iPad, many websites have created iPad specific versions of their sites that are perfectly optimized for tablets, but will never be displayed on your TouchPad because its user agent indicates that it is not an iPad. Not to mention that many websites don't know to check for a device that was cancelled 18 months ago, even though it could fully support those tablet-optimized sites. While most websites will display just fine on your TouchPad, as is, you now have a way to easily update your devices "user agent" to make it masquerade as an iPad, a desktop Chrome browser, or a desktop Firefox browser instead of a webOS 3.0.5 HP TouchPad. All you need to do is load up Preware and install one of the three User Agent Override patches by homebrew developer Garrett92c and then reboot your device. The next time your load up the web browser on your TouchPad, you may notice a different version of your favorite websites, although don't be surprised if the many of the sites you visit still look the exact same. Note that if nothing looks different, you may need to open and close your web browser one time for the change to take affect. Unfortunately, just because you may access sites that are better optimized for your viewing pleasure with one of these user agent override patches, some unexpected behavior may also occur that detracts from your experience. 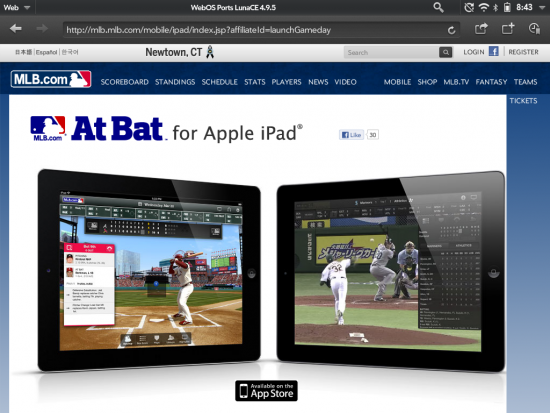 For example, if you have iPad override patch installed and try to load up mlb.com's MLB.TV or its Gameday pitch-by-pitch that works just fine on your stock TouchPad browser, you get redirected to a page with a link to the MLB At Bat app in the Apple App Store (see screenshot above). Or if you go to the Flash-based speedtest.net site, you get a "Cannot open MIME type" error because it's trying to load up the Speedtest app in the App Store (which obviously does not exist on your device). Unfortunately, the only way to access these sites after you have one of these patches installed is to go back into Preware, remove the patch and then re-load up that site. The good piece of news is that even though the iPad does not support Adobe Flash, if you can get to a site on your TouchPad with Flash content, it should still run just fine even with the iPad override patch installed. Give these user agent override patches a shot and decide for yourself if they enhance your browser experience or takes away from it.